Guardian Angels is a uniformed school. We believe that this encourages the children to take pride in their appearance, promotes the image of the school and avoids the problems of competition and fashion. PE uniform should be worn on PE days ONLY and conventional day wear as specified in our policy on all other days. The policy for Guardian Angels has always been BLACK footwear and to make it easier for parents we allow trainers as long as these are BLACK. 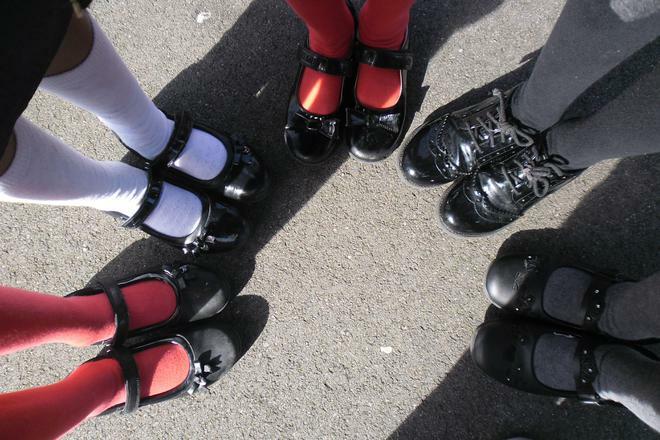 Red shoes/trainers are only permitted during the summer term. On football training days children are allowed to bring in their football boots and change for the purpose of training and should not be wearing these as day wear. This would apply to run training or any other after school sporting training or event. Please make sure that all items of school uniform are clearly labelled with your child's name. Please remind your child to bring a coat, scarf, hat & gloves every day during the winter months. During the summer months please ensure your child brings a named water bottle and hat/cap to school. We also ask that you apply long lasting sun protection before school as our staff are not permitted to apply sunscreen to pupils. The school does not taken responsibility for any items of jewellery lost or stolen. Pupils are not permitted to wear nail varnish. Children are not permitted mobile phones at school. If phones are brought to school: in the first instance these will be confiscated on the day and returned to the child's parents in person at the end of the school day. If however a child after an initial confiscation brings a phone to school then we will be forced to hold the phone for a longer period with a loss of privilege for that child as an additional sanction. If any parent has issues with this policy they can request an appointment to discuss the matter with Mrs. Worrell-Jude.